It is 1” thin and equipped with wireless connection capabilities to let you surf the Net wherever you are. Traveling is also made easier because of its long battery life. And its Hybrid Graphics System lets you regulate your image usage so that you can more efficiently manage your notebook activities and conserve battery life. This 800MHz baby has a dual processor that gives you amazing performance speeds, especially for its size. It weighs 4 lbs, very convenient to lug around, and is made up of carbon-fiber or magnesium, making it very resilient against common travel-related wear. So if you’re hurrying to your next flight, you don’t need to worry much about making sure the Vaio is very neatly fastened and tucked into place. Of course, this doesn’t mean you shouldn’t consciously take care of your unit. The Vaio SZ has a built-in adapter that employs 802.11 n/b/g/a technology for all your wireless connections needs. You can easily send or receive messages without having to get hooked on a cable; plus, you can put in on your lap conveniently and get set up for an afternoon of mail-checking and Web browsing wherever (provided, of course, that there’s a Wi-Fi connection available or you have an SDIO card). And speaking of wireless usage, you don’t really need to be too scared of network threats as the Sony Vaio SZ has a built-in biometric fingerprint sensor and TPM (Trusted Platform Module) that protect you from computer invasions. Another thing that’s great about the Vaio SZ is that you don’t need to wait an eternity to boot up your notebook. Some notebooks take forever to boot, but not this mini powerhouse. It’s perfect for those always on the go, because of its size and speed, and would make a great conversation piece, because of its design, for those who always travel off to somewhere. 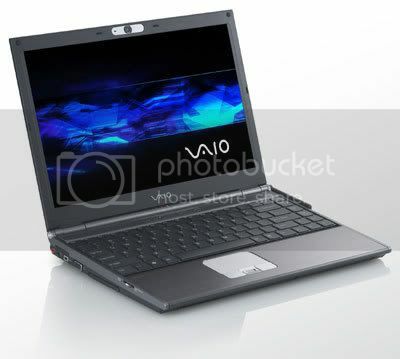 I’m a Mac user, but if I were to assess the Vaio, I’d probably find it a pleasant device to bring along.